If you're exploring the backcountry in your Ford F-150 SVT Raptor, now you can kill a few more hours of daylight four-wheeling instead of stopping to set up a tent camp before the sun sets. Phoenix Campers has created a pop-up slide-in sleeper for Ford's extreme off-road pickup, as reported by the folks at Truck Camper Magazine. Phoenix custom-built the low-profile camper for a new Raptor SuperCrew owner looking for lightweight sleeping quarters that would fit inside the Raptor's short 5.5-foot cargo box with minimal impact to its long-travel performance. The camper even fits with the tailgate closed for extra security, and the truck's built-in tailgate camera can still be used. It's painted the same Molten Orange and includes an extended splash of "digital mud" vinyl graphics that match the pickup's graphics. Inside, the self-contained camper has a refrigerator, three-burner stove, a double sink, a water tank and pump, storage under the bed and a queen-size air mattress with an electric pump. A small dinette can be converted into a five-and-a-half-foot bed. Not very pleasing to the eye but it is functional. Pretty cool. Now they need to come up with one, lightweight, for a Ram Power Wagon. Slide-in campers are not recommended for the Ram Power Wagon 2500. It looks better in the picture showing the camper top popped up and the dining canopy extended. Pretty nice and many features for a low profile camper. This could make a good Rescue Vehicle for the Baja Races. "The weird thing is that I’m a Chevrolet dealer and I drive a Ford pickup. Chevy doesn’t offer the Raptor or anything like it, so I drive the Ford." Yeah, I know that slide-in campers are not recommended for the Ram 2500 Power Wagon. That is why I would like to see; "Phoenix custom-built the low-profile camper for a new Raptor SuperCrew owner looking for lightweight sleeping quarters that would fit inside the Raptor's short 5.5-foot cargo box with minimal impact to its long-travel performance. ", them do the same thing for us Power Wagon owners. That is the ugliest thing I've seen since...well, since the last time I saw a Dodge Ram. Holy crap, where are the U-Haul stickers? So tell me, does it come with an awning and a little string of 12-volt Chinese lanterns? Maybe some folding lawn chairs? There is one flaw. If your sleeping in it at night and someone or somehow the tailgate closes your locked in there. Unless the door opens inwards? Good catch! That makes me envision a panic situation. I like it. It reminds me of the campers by four weheeler campers. It's a little tight inside, but I blame that on the small bed of the Raptor. Not a problem: Just remove the window on the passenger side (youll have to go to the TCM site to see it) and jump out...problem solved! The 3/4-ton Ram Power Wagon is more like a 5/8-ton. The payload capacity is between a Ram 1500 and a standard Ram 2500. Since the Ram 2500 Power Wagon is equipped with specific springs to help it off road, softer for greater articulation, the Dodge (Ram) engineers do not recommend a slide-in camper that a typical owner of a standard Ram 2500 would use. It would degrade the off road capabilities and have too much side-to-side sway I am sure. Queen size air mattress??? How do you fit that in a useless 3' bed? Buy a Van Conversion !! No need for campers on trucks !!! My neighbor used to have a 1977 Dodge VAN CHARGER 4x4 fullsize camperized van !! I bought it off of him,used it for years,best 4x4 around !! Went on any trail the average person goes on,plus you can cook,sleep,shower without setting anything up..Perfect vehicle !! Guys would crap and sleep in the bed of their small pick ups,We would have the comfort of home,even a t.v set up...who could ask for anything more !! GM has awd full size van's...Nothing like going out in the wild with a whole camperized van,fridge,stove,real beds and a SHOWER and toilet !!! Yeah a 5 1/2 foot bed wouldnt work for me I am not a midget !! Being well over 6 feet tall,I need a real man bed,not a small boy bed !! What a waste !!! Looks nice, gives more options for Raptor owners but probably defeats the purpose of the orig Raptor. That is why it has those poles (four) in each corner. If you feel the need to push the Raptor to it's limits...you just drop those camper jacks/stands, pull the truck forward a few feet, and you are off and running. I think that any option that improves the versatility of a truck is a good idea. This camper wouldn't exist if there wasn't an obvious desire for it. This camper will fit in any 5.5 bed Ford pickup. I'd love to own a Raptor but the price is too steep. I hope that one day Ford offers the Raptor package as an add-on to any Ford F150 trim package. I probably would be inclined to "drive it like I stole it" but for the rest of the time, a Raptor with its great suspension would save me a ton of travel time on the forestry roads around my home town. I wonder if they will come up with a camper like this for the Ram Outdoorsman? Just don't order the Rambox. Perhaps this will trigger the return of the, "Camper Special", packages of the Ford, General Motors twins, and Ram trucks? @ Buy American - that might be a good idea. Have you ever considered doing a truck cap review similar to the one you did on winches recently? I'm looking into caps right now, and I don't like to buy junk. If anyone else has any insight please share. I wonder if they still leak like they used to and fall apart after a short period of time? 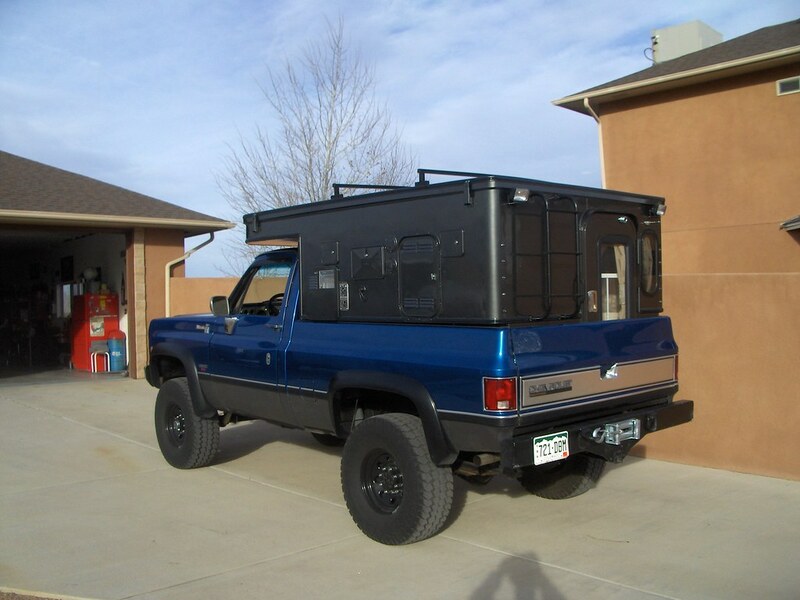 Truck caps/canopies, boat/cargo racks, snowmobile decks, headache racks, box rail guards, box liners,tool boxes, and tonneau cover comparisons would be a nice idea. I don't see too many trucks with a bare pickup box. @Paul Hirsch - are you refering to Phoenix Campers or campers/box caps in general? VERY SYMMETRICAL, THEY SHOULD USE ROUND CORNERS TO MATCH THE SHAPE OF THE TRUCK BETTER, SOMETHING LIKE THE SHAPE OF A 5TH WHEEL TRAILER... WELL THAT'S JUST MY OPINION. A friend of mine had one, leaked the 1st week he had it and basically fell apart after a year doing some serious off roading. I like the idea of a custom camper, but after some searching on Google I found quite a number of unhappy Phoenix camper owners. @Paul Hirsch, thanks. What I'm hoping to get some feedback on though are caps, not campers. Leer, A.R.E., SnugTop, etc. I know many of these are junk, but it's hard to know which ones are the best and which ones are junk built in China on the internet. I see a lot of Leer around and they seem to hold up. A crew cab truck with a cap is the way to go for anyone looking at a Suburban or Expedition EL that needs the room a Suburban offers but doesn't need a 3rd row if seats. You can deck out an F-150 and out a cap on it for around $40K, while a similarly equipped Expedition EL costs $15K more. @Paul Hirsch - thanks for the heads up. I found a "camper" that amounted to an aluminum bodied tent trailer style box than fits in the back of a pickup. That might be more durable than one of these. The only problem is I that they do not come in a 5.5 box length. They weigh around 450 lb. I wish it came with a rigid top cover as opposed to a tarp. @ unclebud - I've been looking at canopies as well. I don't like the ones made with a lip that moulds over the side of the box to make the truck look like an SUV. I've been looking at Arrow canopies. They are Canadian made and I'm not sure if you can get them in the USA. If you are looking at a work canopy, I've seen some HD aluminum ones that look more like a service body than a cap. I didn't catch a brand name so I am assuming they were custom made. I'm liking the A.R.E. CX. I wish someone could tell me if it's worth a damn. I actually like it a lot. What some of you don't realize is that this truck was made for jumping and going 100mph through the desert, as well as crawling along pretty much anything else the desert can throw at it. This camper makes it even better because it doesn't compromise off-road capability much, and you can always take it off and cruise the desert. 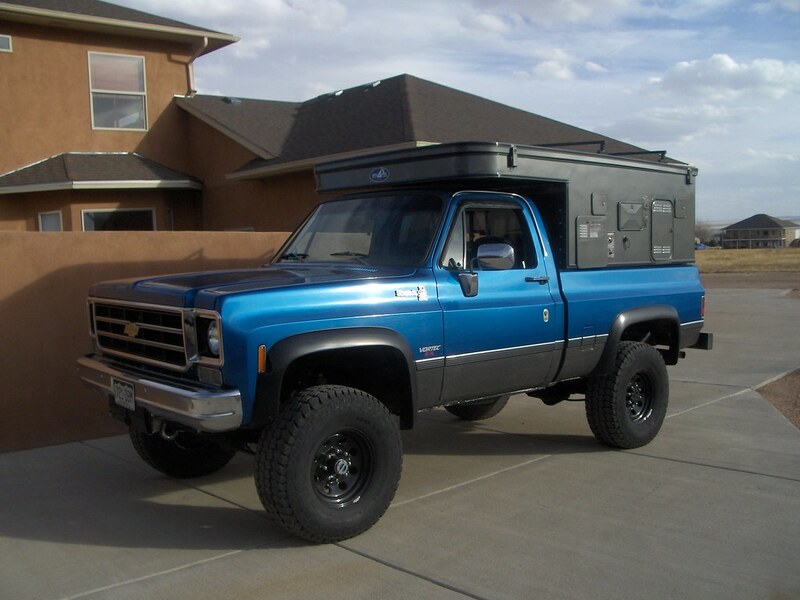 This would be especially useful for people who go to the desert a lot, but end up taking a toy hauler, or motorhome and trailer, just to get their modified 4X4, sand rail, quads, etc. to the desert. With this, you have the RV on the truck, and the truck itself is the toy. Then if you want you can pull along an 8,000lb trailer. I love it. I did a sticky for RV NET on Truck Camper Manufacturers in Australia. We have quite a few Unconventional TC's, that are used for extreme conditions.